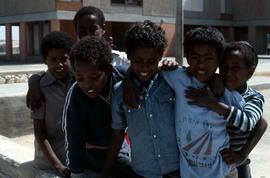 Kodachrome 35mm slide depicts six unidentified Ethiopian boys, in Jerusalem, Israel. 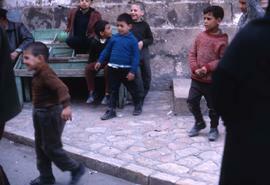 Kodachrome 35mm slide depicts six unidentified children standing on an unidentified street, in Jerusalem, Israel. Kodachrome 35mm slide depicts an unidentified group of children, three boys and one girl, playing, in Jerusalem, Israel.